Once upon a time, grocery shopping used to be a fun and sought-after experience but in today’s fast paced life, it has become a real chore. Have you ever wondered how grocery shopping can get easier for you? Much like in more developed markets like the United States, Dubai Residents have started embracing new services to bring much needed convenience to their lives. According to several surveys, ‘Grocery Shopping’ is one of the top 3 “chores” that people want to spend less time doing and need help with. Following international trends, a Dubai-based Startup, el Grocer, has launched a new grocery delivery App to help improve shoppers’ lives. “Our Vision is to create a seamless and connected grocery shopping experience by connecting grocery shoppers, retailers, and brands on our App in order to transform the way grocery shopping is done’ says Mickael Costache, co-founder of el Grocer. el Grocer is also getting into the spotlight at the international level, having won the Gold Award at the Publicis90 global competition organized by Publicis Groupe, the world’s leading advertising agency. The aim of this initiative has been to find and support the 90 startups worldwide showing the biggest potential for success. The jury had the hard task of going though over 6,000 startups from 141 countries with el Grocer being crowned with a Gold award. In an effort to support FMCG brands’ presence online beyond the standard digital marketing process and into more sales generating online activities, Henkel and el Grocer have entered into a partnership, which is the first of its kind in the region. The deal is a pilot test aiming to use global best practices to deliver a great online shopping experience utilizing Henkel’s flagship brands and brand equity and generate measurable sales via direct (or immediate) promo codes/discounts, sampling, as well as supporting top-of-mind awareness. Looking back on nearly 140 years of success, Henkel’s vision is to become a global leader in brands and technologies. Today, Henkel globally holds leading market positions both in the consumer and industrial sectors. The company is headquartered in D�sseldorf, Germany and proud of its nearly 50,000 employees from more than 120 nations worldwide. Henkel in the GCC was established in 1998 and has grown rapidly since then. With its regional headquarters based in Dubai (UAE), Henkel also operates a R&D centre for the region in Dubai (UAE) and a plant in Riyadh (Saudi Arabia) for its Laundry & Home Care products. With the fast growth rate seen in digitalization, Henkel and el Grocer collaborated to take on a new opportunity in the consumer goods industry, giving life to yet another innovative idea. Through this collaboration, consumers in Dubai will be able to do their grocery shopping from the comfort of their homes or offices and pick their products via virtual baskets before having them delivered at their doorsteps within a maximum period of one hour. With continuous promotions on the Henkel Laundry and Home Care products through the el Grocer mobile application, consumers will be able to get great value deals and receive notifications on nearby supermarkets discounts and offers. 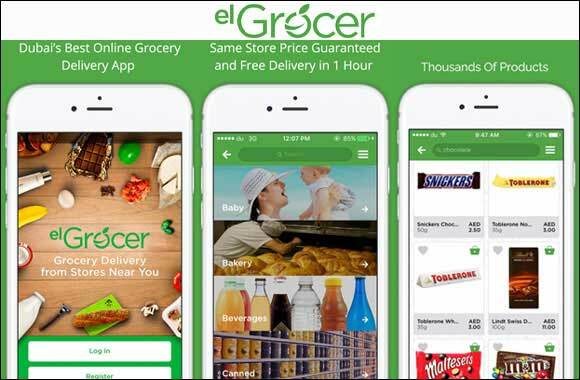 The el Grocer App allows shoppers to browse products online and avoid wrong orders, all free of delivery charge. The UAE has the perfect infrastructure for delivery and now grocery shopping has become much easier thanks to el Grocer. The delivery service is currently operational in most areas in Dubai, with further expansion plans in the coming weeks to cover other cities in the UAE. el Grocer (www.elgrocer.com) is a grocery ordering & delivery marketplace startup founded in 2015 in the UAE. With a strong, diversified team of angel investors and advisors, el Grocer hopes to make shoppers’, grocers’, and brands’ lives easier. el Grocer is currently incubated by Nuummite Consulting (http://nuummiteconsulting.com/) which was established to support MENA based businesses to grow, restructure, turn-around or chart new strategies within their respective industries.